I set apart pdftk from the rasher of other pdf-entitled tools for two reasons: One, because I already swept through Coherent PDF Tools a few months ago, and it seems fair to include another PDF suite; and two, because jojo and Antonio both suggested it. And yet, if you were to combine (almost) all of those into one suite, you would probably come up with something weakly resembling pdftk. And chances are you’d still have quite a few functions available in pdftk that hadn’t been tackled individually. 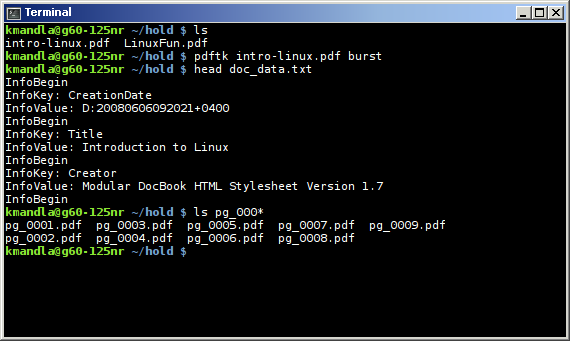 pdftk will handle the mundane tasks — like splitting, merging, rotating and “bursting” PDF files — but it can also flatten PDF forms into single files of form and data, encrypt at 40 or 128 bits with passwords, collate scanned pages in reverse order, preserve document IDs across input and output files, stamp pages a la watermarking, fill PDF forms from external files, and a lot — no, I mean a lot of other things. Now … there’s no color. And there’s no real interface to speak of. I know those are minor shortcomings. But I think jojo and Antonio were both right when they suggested pdftk; it’s obvious this is a tool done right. This entry was posted in Linux and tagged convert, edit, file, manage, pdf on 2014/02/28 by K.Mandla. pdftk is great for splitting pdf and package pdf-site in new order or make a background image for your own pdf. i use pdftk every day. Haha – didn’t want this to get left off the list!! I also use pdftk every day. It’s not perfect: 1) Arch build is a huge PITA; 2) I think it’s built on top of a pdf tool that’s less-than-current; and 3) I think the author is no longer working on pdftk. However, as long as we have to deal with PDFs for work, this tool makes it a bit easier. Would be great if everyone migrated away from this adobe creature, but that’ll happen around the same time people finally stop attaching .docx files to emails.